You have just downloaded the space exploration game Games No Man's Sky and unfortunately, you have been experiencing lag, slowdown, jerk or stutter issues. Though the game runs smoothly with many players, there are some reports of performance issues, lags in certain situations such as when entering a planet's atmosphere, as well as when entering the spaceship and much more. Here you'll find some useful tips to fix those errors and run No Man's Sky smoothly on your PC. No Man's Sky jerky - what to do? 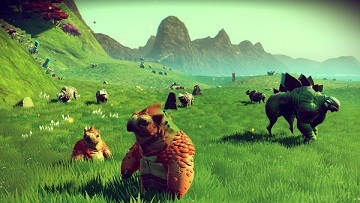 Of course, your computer must meet the minimum system requirements in order to play No Man's Sky smoothly and without any fps drops. Also be sure to download and install all the available patches, which will improve performance in general. If the problems persist despite good hardware and a modern PC, then you should consider and carry out the following tips. It is always advisable to keep the graphics card drivers up to date. On Reddit we find some threads where we read that outdated drivers of graphics card probably the cause of crashes and freezes issues. Therefore, it is necessarily to double check the graphics card driver and if necessary, download and install the latest version. In our case, we had experienced with stuttering right after game start, although the drivers are all up to date and recommended system requirements are more than met. We have increased the Max FPS in the settings, these are set to 30 FPS, once we have increased the value to "MAX", the game was run smoothly, especially when flying over the planetary surface and entering the atmosphere of a planet. When set to "60 FPS" strangely it was run only 30 to 40 frames per second and when set to "Max FPS" we came to an average of 70 to 80 frames per second (GTX 970). We still don’t know the reason why this happened. Furthermore, we also noticed a small FPS boost when we disabled the Vsync. Unfortunately, many already known graphic errors are still exists, these will probably be fixed in the next update. No Mans Sky does not start - what to do? Although, there are many players seemingly have no problem with the game won't start issues. But there are some cases where the No Man's Sky will start smoothly and then crashes with a black screen. Those who have purchased the game on Steam and not yet installed the update, then you should do as soon as possible. There are several reports on Reddit and in the Steam forums that the game has been successfully run after the update. In Steam, there is the possibility to check the downloaded game files, also said to have helped in some cases. - Open Steam and your library. - Click the right mouse button on the entry for No Man's Sky and open the properties. - Wait until the process complete and then re-start the game again. Here, we have summarized some possible and frequently mentioned causes. Please note that the solutions listed here are certainly not yet completed and this post will be updated regularly to include more tips.